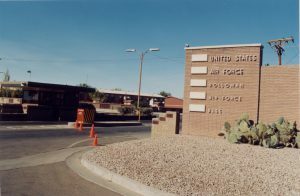 The source of Ike’s visit to Holloman comes from an ex-airman stationed at the base hospital. 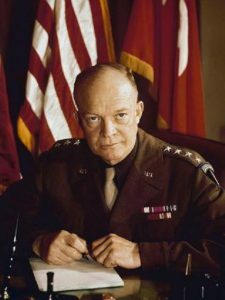 The airman wrote a seven-page letter to UFO investigator/ speaker Art Campbell, delineating the details of Ike’s visit and some of the activities while there. 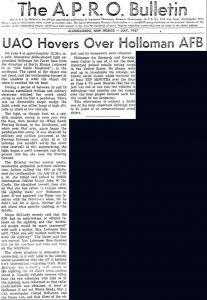 The Columbine III, Ike’s Air Force One at the time, landed at Holloman around 9:00 a.m. on Feb. 11th. By previous arrangement, the plane taxied and parked on an active runway. A short time later a UFO was seen to land in front of Air Force One. 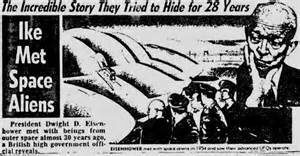 A man presumed to be Ike left the parked plane and walked to the UFO. A meeting of some 45 minutes took place and then he returned to the plane. Another UFO was seen hovering over the flight line while the meeting was going on.